China’s response to the global financial crisis created an unprecedented expansion of bank lending after 2008, spurring a host of state-sponsored economic actors— including SOEs, state banks, and local governments—to expand their off-balance sheet activities. Off-balance sheet activities and shadow banking are estimated to account for 26-69% of China’s entire GDP (see figure on page 2 for details). To reduce some of the risks associated with shadow banking, China must implement deeper SOE reforms, increase market access in the services sector, establish small- and medium-sized banks, and set up channels for debt issuance by local governments. China’s pattern of state capitalism is associated with directed credit and financial repression, which has privileged state-owned enterprises (SOEs) over private firms. However, the monetary expansion of the late 2000s, coupled with new technologies of finance, have led to a remarkably “liberalized” financial environment, in which both state and non-state actors are involved in shadow banking. Novel forms of Internet financing, wealth management funds, and local government financing vehicles have flourished in the last five years. Yet this pluralization of financial products from financial marketization did not result from de-regulation or liberalization of interest rates. Instead, continued financial repression, combined with monetary expansion and new technologies of finance, has fueled shadow banking within the broader context of state capitalism in China. Although over 99 percent of registered firms are small and medium enterprises, state-affiliated firms receive over 85 percent of loans extended by state-owned commercial banks, and account for over 60 percent of publicly listed businesses on China’s stock markets. Private businesses have thus relied on a variety of informal financing mechanisms since the earliest years of reform. More recently, the scope of informal finance has expanded into the broader universe of shadow banking, involving not only private entrepreneurs, but also middle-class professionals seeking wealth management products and local governments facing unfunded mandates. The contemporary map of informal finance and shadow banking has intersected with vested interests in the state sector. Informal finance refers to financing, savings, and investment vehicles that are not sanctioned by the People’s Bank of China, but most types are not explicitly banned. Various informal financing arrangements and non-banking financial institutions are either registered with other official entities—or quietly condoned because they provide financial services to underserved local markets. The least institutionalized forms of informal finance include interest-free, uncollateralized loans among friends, families, and business associates. Similarly, extending trade credit is a standard operating practice among private vendors. Borrowing from individual money lenders and money brokers (called qianzhong, yinbei, or duidengzhe, sometimes with high rates of interest and use of collateral, is also common among business owners. Some forms of informal finance entail written terms and greater organizational complexity, as with rotating credit and savings associations (ROSCAs or hui), which are primarily found in southeastern provinces. Other types of unregistered, quasi-institutionalized informal finance include nongovernmental investment alliances and reciprocal loan-guarantee networks. At the more institutionalized end are nonbanking financial institutions registered with the Industrial and Commercial Management Bureau or other official entities. These include pawnshops, trust and investment companies, leasing companies, credit guarantee companies, microfinance companies, rural credit unions, and financing arms of registered companies. In addition to reinforcing the types of informal finance used by private entrepreneurs and investors, China’s 2008 stimulus plan incentivized the rapid expansion of shadow banking among government entities. 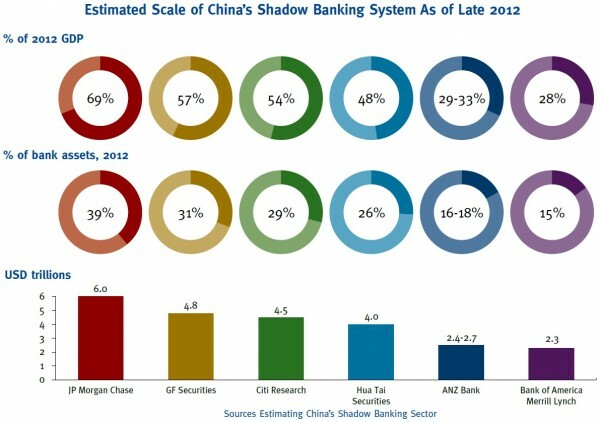 The Financial Stability Board defines shadow banking more broadly as “the system of credit intermediation that involves entities and activities fully or partially outside the regular banking system, or non-bank credit intermediation in short.” In China shadow banking includes the types of informal finance discussed above, but also encompasses local government debt and wealth management products. Between 2008 and 2010, what started out as a 4 trillion RMB ($586 billion) infrastructure investment program funded by fiscal authorities expanded into a 12 trillion investment program funded primarily through shadow bank lending to local governments. Local government financing vehicles (LGFVs) became the primary channel through which sub-national governments financed public goods. They also (over)invested in other types of capital-intensive industries such as real estate, mining, shipbuilding, solar energy, and steel. By 2011, it was clear that the stimulus had contributed to excess capacity in these industries, bringing local governments cash-flow challenges in meeting debt service obligations and repaying short-term loans. A national audit revealed local government debt had reached 17.9 trillion yuan ($2.9 trillion) by mid-2013. Besides contributing to local debt, the stimulus incentivized banks, SOEs, and state-affiliated entities with access to bank credit to provide loan guarantees for private borrowers. They also extended loans to real estate developers and private businesses through trust companies. In turn, trusts connected to state banks issued wealth management products (WMP) to investors seeking higher returns than the 3.3 percent deposit rates in regular savings accounts. By the end of 2014, the China Banking Regulatory Commission reported that banks held 15.02 trillion yuan ($2.37 trillion) in outstanding WMPs through trust companies. Finally, the stimulus coincided with the spread of Internet access and social media in China. By 2014, over 60% of China’s online population had used Internet financing products. The main types of Internet and mobile finance include: third-party payment services, crowdfunding, peer-to-peer (P2P) platforms, online WMPs, online insurance services, and online securities platforms. 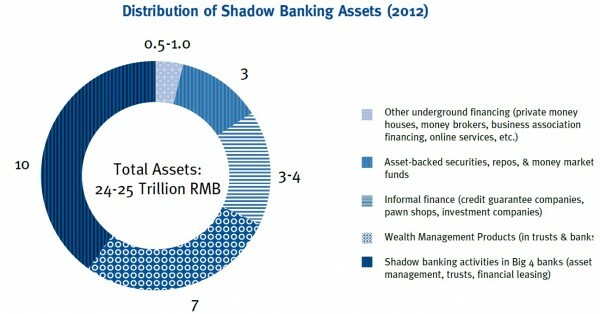 Due to its unregulated character, Internet finance is regarded as part of shadow banking in China. Since the late 2000s, one of the fastest growing segments of Internet finance is online lending through peer-to-peer (P2P) networks, which match lenders and borrowers who are typically unknown to one another. As of July 2015, there were 2,136 P2P sites in China with an annual transaction volume of over 105 billion yuan. Despite continuing private sector demand for loans from trust companies and higher returns from WMPs and P2P platforms, shadow banking carries risk to the entire network of participants. These risks derive from the structural constraints of state capitalism and financial repression. Private entrepreneurs have engaged in financial arbitrage between state-mandated ceilings on interest rates on the one hand, and market demand for SME financing and higher returns on savings, on the other. If China’s commercial banks were not state-dominated and priced loans in risk-adjusted market terms, then interest rates on both savings and lending rates would approach the curb market rates of 15 to 20 percent on deposits, and an additional margin of five to ten percent on short-term loans. Instead, shadow banking has expanded significantly since the 2008 fiscal stimulus. The scale of shadow banking in China ranges from an estimated 26 to 69 percent of the country’s GDP, and nearly half of shadow banking activity involves off-balance sheet activities of official state banks. The rapidity of its expansion since 2010 (when banks reduced lending) and on-going cases of financial failure in the sector has raised concerns about inadequate/absent supervision. As such, in 2014 the State Council issued Document No. 107 to ensure that each of the specific forms of shadow banking is subject to regulation by a specific agency or institution. Deepening market reform poses challenges because both SOEs and state banks are vested in financial repression. The maintenance of a wide spread between the ceiling on savings deposit rates and a floor on bank lending rates has enabled banks to generate substantial profits. Meanwhile, SOEs and other large businesses have benefited from subsidized credit. Much of China’s real estate boom can also be traced to financial repression, given the combination of subsidized credit and savers seeking higher returns. The segments of China’s political economy that stand the most the lose with interest rate liberalization and opening of previously restricted sectors to private investment would be the “middle class” beneficiaries of state capitalism. Pillar industries (such as finance, petroleum, energy, steel, petrochemicals) have thrived under a host of financial, fiscal, and production benefits. Increases in the cost of credit, the amount of taxes remitted to the center, and price of inputs would diminish profit margins. State banks and SOEs in select industries would be exposed to greater competition. In addition, the rate of non-performing loans in state banks, while low compared to the late 1990s, would continue to rise and require writing off bad assets. The other major group of vested interests are local governments who developed reliance on local government financing vehicles (LGFVs) over the last five years. LGFVs provided a means for local governments to match central stimulus funds by investing in local real estate and infrastructure projects, and financing various public goods. This fiscal dimension of shadow banking will be challenging to dismantle, but the Ministry of Finance is working on a regulated framework for local borrowing, starting with experimental municipal bond markets. Unprecedented expansion of bank lending after 2008 created opportunities for state economic actors—including SOEs, state banks, and local governments—to expand their participation in off-balance sheet activities. Yet the resulting vibrancy of shadow banking did not result from financial deregulation. The government’s Keynesian effort to avoid recession inadvertently incentivized the very agents of state capitalism to partake in shadow banking. The concomitant spread of internet and social media fueled an equally unexpected “liberalization” in the technologies of and participants in informal finance. Middle class savers are investing in wealth management products through mobile devices, and those same products are being invested in a variety of private ventures promising high returns. State capitalism and shadow banking have now intersected and developed areas of mutual dependence, or more accurately, mutual liability. The risks associated with such mutual liability are not trivial. The increased engagement of public sector actors in shadow banking practices means that crises in informal finance are less likely to be contained to a particular locality or network of private business owners because both banking and non-banking financial institutions are engaged in off balance sheet transactions that are supposedly collateralized by state assets and real estate. Various reform measures would erode the edges of state capitalism and reduce some of the risks associated with shadow banking, including: SOE reform, increasing market access in the services sector, establishing private small- and medium sized banks, and setting up channels for the issuance of debt by local governments. Meanwhile, shadow banking will continue to play a role in intermediating funds to reach their highest return. Such returns may be generated by inadequate regulation, inefficient investments, or arbitraged from state sources. When the formal financial system is constrained by policy considerations, shadow banking flourishes. Kellee Tsai is currently Chair Professor and Head of the Division of Social Science at the Hong Kong University of Science and Technology (HKUST) and Faculty Associate with the HKUST IEMS. Prior to joining HKUST, Prof. Tsai was Vice Dean for Humanities and Social Sciences (2010-13) and Professor of Political Science at Johns Hopkins University. Prof. Tsai is regarded as an authority on informal finance and private entrepreneurship in China. She has published five books, including Back-Alley Banking: Private Entrepreneurs in China (Cornell 2002), Capitalism without Democracy: The Private Sector in Contemporary China (Cornell 2007), and State Capitalism, Institutional Adaptation, and the Chinese Miracle (with Barry Naughton) (Cambridge 2015).